The heat pump heater has a fan that draws in the outside air and directs it over the evaporator coil. Liquid refrigerant within the evaporator coil absorbs the heat from the outside air and becomes a gas. The warm gas in the coil then passes through the compressor which increases the heat, creating a very hot gas. This hot gas then passes through the condenser. The condenser transfers the heat from the hot gas to the cooler pool water circulating through the heater. The heated water then returns to the pool. The hot gas flows through the condenser coil, returns to liquid form and then back to the evaporator, where the whole process begins again. 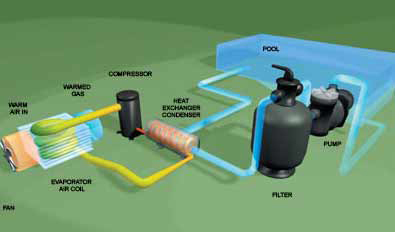 Example of how a heat pump operates. Heat pumps work efficiently as long as the outside temperature remains above 10ºC–15ºC. The cooler the outside air, the more energy they will use. Since most people use outdoor swimming pools during warm and mild weather, this usually isn’t an issue! You can significantly reduce swimming pool heating costs by installing a solar pool heater. The cost compares with both gas and heat pump pool heaters, and they have very low annual operating costs. Example of a solar pool heating system. 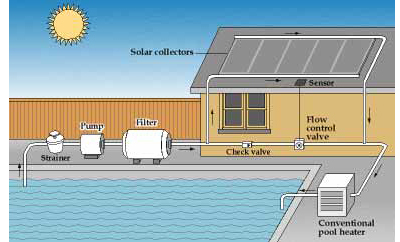 Pool water is pumped through the filter and then through the solar collector(s), where it is heated before it is returned to the pool. Some systems include sensors and an automatic or manual valve to divert water through the collector(s) when the collector temperature is sufficiently greater than the pool temperature (normally during the day). When the collector temperature is similar to the pool temperature( normally at night), the water simply bypasses the collector(s) and is returned straight back to the pool.